Today's Draw: Key in the House of The Book, using Melissa Hill's Postmark Lenormand and my own Deck of Lenormand Houses. If you saw a friend on the verge of making what you thought was a big mistake, what would you do or say? How far would you go to stop them? When do you love someone so much that you set them free? Today I'm using Lenormand instead of tarot and I'm using my Deck of Lenormand Houses. 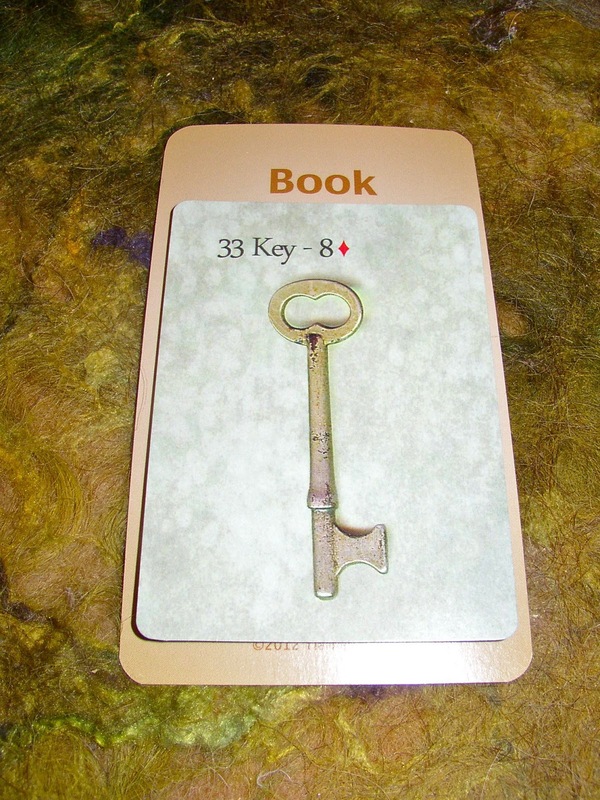 Right this second, the Deck of Lenormand Houses is sold out, but I'm expecting a new shipment soon, if anyone's interested. They're a good teaching and learning tool, in addition to working the same way with Lenormand that my Deck of 1000 Spreads works with tarot. But enough of that. The House of the Book is the house of secrets, knowledge and mystery. And The Key is about solutions, breakthroughs, karmic lessons and destiny. This all conjures up something I've been thinking about for a couple weeks—and something I just discussed with a friend over dinner tonight. If someone needs to learn a lesson, the universe will make them learn it. We don't know why the lesson is being brought to them, but it's for a reason. So let them learn it. What I mean by that is that we often want to "save" our friends or children from bad situations. Let's say, for example, your friend has taken up with someone that you know is just using them. Certainly you want to talk to your friend and let them know you're concerned. But there are times we try to insert ourselves further into situations like this....maybe we pray on their behalf that they'll dump the friend. Or maybe we go to the friend and buy them off...haha. I don't know. I'm just making things up. But you get my point. We try to "save" our friend from what we know is going to be certain pain. But are we really saving our friend? Are we really doing good? And when we insert ourselves into the fate of another, what kind of energy are we bringing back on ourselves? How much of another's path is our business? Your friend may be too trusting for her own good. And if you save her, and she's not able to learn her lesson, then what if the next person who comes along is worse than the first? What if they don't just hurt her emotionally, but physically this time? And what if she's now less willing to listen to you because you imposed on her friendship with the other person before? The way I believe, we all come here to learn certain lessons. And while it may hurt to see our loved ones learn their lessons, their lessons are theirs to learn. We have no dominion over whether or not those lessons get learned. And as you know from your own life, just telling someone that something's bad isn't really going to deter them if they're fixated on it. So we can ground our sons to keep them away from harlots, but the second they're out from under our thumb, they'll be in a harlot's arms...haha. Only now the harlot will be older and more cunning. So were we really doing him a service keeping him from the slightly slutty 16 year old that could have taught him his lesson years ago? I have a feeling this is going to be a hard one for a lot of people. Because it is hard. When do you insert yourself and when do you allow them their own path? Where do you draw the line? In fact, many people don't even see someone else's life as "their path". They see their loved ones as being their responsibility. But each of has to take command of our own lives and our own lessons. Further, I believe each of us have an agreement with our god in this regard and there's nothing anyone else can do about it. The lessons will get learned. But the thing we all have to decide for ourselves is where we draw that line. Every parent has had to face this dilemma at one time or another, I assume. But the same goes for our friends and family members, too. Their lessons aren't ours to derail. And we not only do them a disservice by trying to do that, we also court the teaching of a lesson in our own lives about interference. That may manifest in many ways, including pushing the other person away. With me, I'll probably always say something to the person. Something along the lines of "I'm concerned about this person, because I've seen them hurt others before and I don't want the same to happen to you." And then I'll follow with something like, "I'm concerned, but I support whatever choice you make and, if anything does happen, I'll be here for you. In fact, I won't even say I told you so." In the end, that's really all we can do.